I’m part of a research grant on neighbourhood changes in Canadian cities, the Neighbourhood Change Research Partnership, which examines the ways in which our cities are changing in areas such as affordable housing, income inequality, and poverty. Our Principal Investigator is Dr. David Hulchanski at the University of Toronto, and there are research teams in Halifax, Montreal, Winnipeg, Calgary, and Vancouver. As a member of the Halifax team, I presented our research on rooming houses in a previous post. The research found that over half of people living in the Toronto area felt that factors like race and gender were a barrier to success, and that the next generation would be worse off. The researchers believed that increasing income inequality was threatening the Opportunity Equation. The update to this report, released on November 1, 2017, updates the analysis with data from the 2016 Census and also looks at the trends in Montreal, Calgary, and Vancouver. The main findings were that income inequality continues to grow in all of these cities, and is geographically dispersed across the Toronto region. 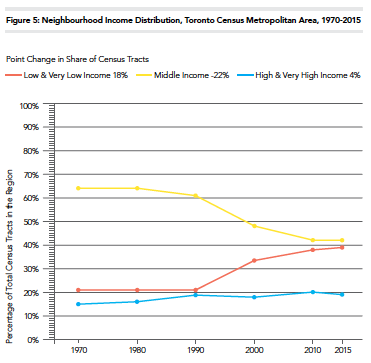 A majority of Toronto neighbourhoods are now either high- or low-income, with middle-income neighbourhoods disappearing. In 1970, almost two thirds (64%) of neighbourhoods were middle-income, though only 42% were in 2015. In contrast, low- and very low-income neighbourhoods together made up about one-fifth (21%) of the Toronto CMA’s neighbourhoods in 1980. By 2015, they made up 39% of all neighbourhoods. High- and very high-income neighbourhoods grew from 15 % to 19%. The highest increase in income inequality in the Toronto region were in the City of Toronto and the lowest in Durham Region. Based on the findings from the first report, the authors called on all partners and sectors to address three issues: providing young people with opportunities, helping develop a more stable, secure labour market, and helping ensure that background and circumstances are not barriers to opportunity. The United Way launched an Anchor Agency investment strategy, ensuring people have a broad range of services available close to their homes, a Youth Success Strategy to connect youth with multiple barriers to meaningful career opportunities, and continues to build on its Building Strong Neighbourhoods Strategy to tackle the lack of economic opportunities in many areas across the city. The update report builds on this message and encourage more partners across various sectors to address the challenges.